Never mind the wicked sun, the summers are the best time of the year for kids to let their hair down. What with schools off for several months, movies, games, parties, fights, cries, bruises, cruises, get-togethers, camps, card games and so much more becomes the order of the day for the kids. And then, there are game apps as well. I can imagine kids sitting together in groups, racking their brains, cracking their head, competing with each other, to solve those puzzling games. So, is your hyperactive kid hooked to game apps? Why not introduce him/her to some good educational apps instead, which will not only keep them busy, but also boost their IQ in a big way. Here go the 10 educational apps that could make your kid’s summer vacations more fun-filled and meaningful. Bid adieu to CDs and DVDs. Download the funny ELMO Loves 123s now. Why? Beacuse the app helps your little one learn his/her 123s, effortlessly. The app, in fact, helps kids identify and count numbers from 1 to 20. Plus, it helps them do simple additions and subtractions. Besides tracing different numbers, the app also pushes the kids toward solving puzzles and even coloring pages. Elmo Loves 123s is one app that makes learning fun for kids. Available for children aged 5 and under, for $2.99. Available on iPad. Got toddlers at home who are on the brink of entering pre-schools? Then this app is a must for you. Believe it or not, the app trains your kid in self-control, focus; and most importantly, can help your toddler develop a sense of direction. Isn’t that awesome? The app comprises nine different levels of mini games designed to fine-tune your tiny one’s skill sets. Available for 3 years and above, for $2.99. Available on iPad and Android. Does your little girl love tinkering with toys? Don’t hold her back. (I know, you won’t). Instead, encourage her curiosity levels. The app GoldieBlox and Movie Machine, is perfectly designed to inspire such girls and help them be the engineers of tomorrow. The app helps them learn the basics of animation and also prompts them to create their own one-second animated GIFs. Ideal for 6+ year old kids and is available on iPhone and iPad for free. Wish to see your child become accomplished author? Get Tikatok Story Spark for him/her now. From the stables of behemoth Barnes & Noble, Tikatok StorySpark helps your kid put together all his/her illustrations, write-ups, photos, digital drawings and more under one app. Kids can even pick images from their own personal album and could also use their best digital drawings to form the book’s background. And that’s not it. Once the book is done, it can be published on a chosen pen name and posted online at Tikatok.com. What’s more, it can be accessed on iPad, iPhone, iPod Touch, Android. The books are available for $3 each, while the app comes free. Make reading fun for kids with MeeGenius. For all the serious, boring books out there, don’t forget, children prefer fun content. Set up with different engaging narration options, MeeGenius is one app that offers kids what they really want: Loads of fun reading. The book is available both offline and online. And, if the child wants, he/she could replace his/her favorite character by tweaking the personalization element a tad bit. The app can be accessed on iPad, iPhone, Android, Google TV and more, and is available for free with book selection. Being a mother, I know, there’s no greater joy in this world, if your 3-year-old is inclined towards words and numbers. Reading raven is one such app that familiarizes your 3-year-old to different letters and sound correspondence feature. Further, it helps the 5+ year olds to record their voice, while they are decoding simple letter words. In addition, they’d be able to figure the letters in the words by themselves, which in way will reinforce letter formation. If these weren’t enough, kids can even record the entire simple sentence by themselves. And, yes, there’s Volume 2 as well for those who’ve already completed the first app. Available on iPhone and iPad for $2.99. If your child is turning out to be reading addict, this app is meant for him/her. The app helps develop critical thinking and comprehension skills of kids. In fact, the app goes a notch higher, by encouraging kids toward abstract thinking and inference. This is one of the biggest pluses of this app. However, there one issue that might act as a turn off - the app is quite pricey. The app contains no fewer than 300 stories (Wow!) which you can read it along with your child. More than that, you can record the entire video of your storytime experience with your kid. This makes sure that your little one can watch it, over and over again, if he/she she wants to, especially if you are not around. The app is available for iPad, iPhone, iPod Touch for $10 per month. Your much-loved, classic book by Dr. Seuss had finally come alive in the form of an app. The app comes in three variations: Read to Me, Read by Myself, or Auto Play. Plus, it comes with a voice recording option as well, whereby your child can read aloud and record his/her own voice. What’s more, you or your child can track minutes spent on reading, highlight narration, explore new vocabulary. It’s a complete fun app, full of awesome animation, playful interactivity and so much more. Farfaria is primarily a digitial library of books. This free to download app allows you to read one book per day for free, until the trial period gets over. But once the trial period is over, you need to subscribe. The app consists of reasonable number of good books. In fact, you can choose books on the basis of your child’s reading levels. Plus, you can read the books aloud to your kids, or the kids can do that all by themselves. Furthermore, you can auto play them as well. Summer vacations is the time when the kids have a whole lot of free time at hand. Of course, they’ll be busy with their regular stuff like outdoor games and all. But then, introducing apps at this tender age will keep them up to speed with times, if not ahead, and prepare them for the future. 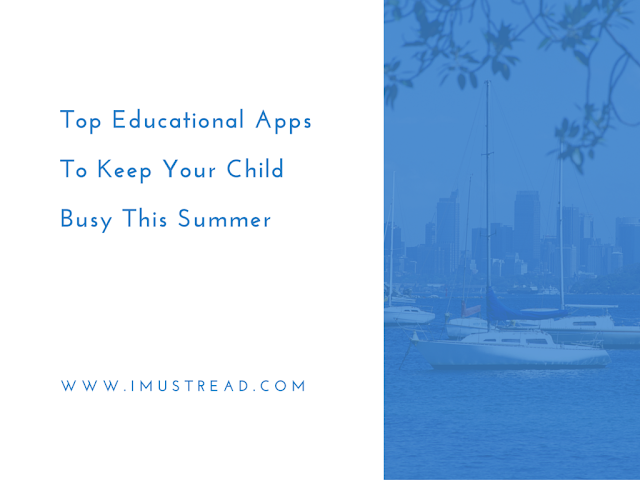 So, go ahead and download these educational apps this summer and get your child schooled in them without much ado. Jini Maxin is a Sr. Writer with Openxcell mobile app development company. Besides being a word enthusiast, she is a book-addict, mind traveler, peekaboo worshipper, who loves to monkey around with her family during weekends.